I wrote the following article for The New Paper, and it was published on 17 October 2013. The topic of national service has been in the news recently, not just because of the release of a national survey but comments made by some who hated their experience. My own attitude towards national service has changed over the years. 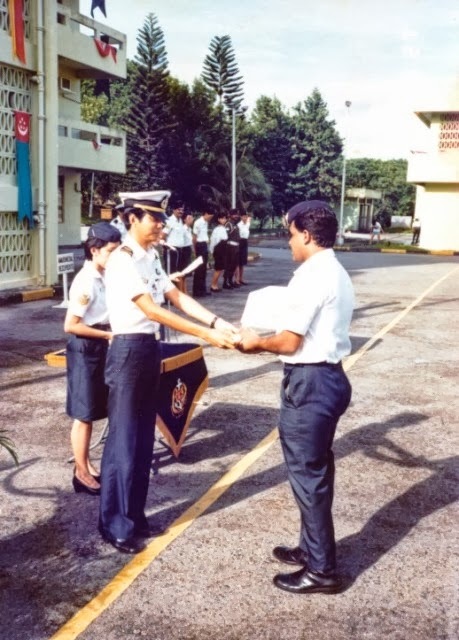 I recall what it was like for me when I turned 18 — we had all arrived in a three-tonner at Sembawang Basic Military Training camp and assembled at the parade square. An officer soon came around and started talking to some of us. He then came to me and asked: “Who are you?”. I straightened my shoulders and replied: “Ravi, Sir!” The officer looked sternly into my eyes and said: “I have two things to tell you. One, I’m not sir — I’m corporal. “Two, you are a @#% recruit. Got it? !” Before I could even fully comprehend what he had told me, he moved on to chat with the guy next in line. That was in the late 1980s. I did not particularly enjoy national service. I’m a free spirit and felt the strict regimentation stifling. I hated performing guard duties. In fact, I did not even know what they were for. I did not understand the logic for checking in at 2359 hours. Six months before my actual ROD (run-out date — now it’s ORD), I started counting-down. When my ROD finally came, I celebrated! Now 25 years later, I feel somewhat differently. As I look back, it was during my stint in national service that I first developed a sense of patriotism. It was during my time in national service that I learnt to speak Malay (it was the lingua-franca then) because I had to communicate with others in my platoon who came from diverse backgrounds. It was national service which made me first realise who I was, and what I wanted in life. It’s for these reasons, even if I feel uncertain and anxious about my son having to do national service next year, I find myself encouraging him to go through this rite of passage. This is a sacrifice the sons of Singapore have to make so that our nation can be safe. An Institute of Policy Studies (IPS) survey found that more than 98 per cent of respondents support national service as a rite of passage. He referred to the Government’s Population White Paper proposal — citizens could possibly make-up 55 per cent of the projected population in 2030. That will include new citizens brought in at a suggested rate of 15,000 to 25,000 per year over the next 18 years. My hope is that new citizens see that and like my son and me before him, encourage their sons to do national service too. Only then will they be able to call themselves Singaporeans. The problem is... We do not want to defend our current ways of life. The status quo is rejected.